JUNEAU, Alaska, May 24, 2011 (ENS) – Marine biologists from the United States and Canada are on a three-week expedition studying sea otters to document the ecological health of the Pacific coastline. The Pacific Nearshore Project is a multi-national, multi-agency project investigating sea otters as health indicators of coastal waters and marine resources from California north through Canada and Alaska. Sixteen researchers from four research institutions will sail between Juneau and Ketchikan, capturing sea otters for physical exams, biopsies, and blood tests, observing sea otter feeding behavior, and collecting samples from fish and other species that hold clues to the ecological health of the coast. Sea otters are an apex predator of the nearshore ecosystem, at the center of the local food web. Sunlight and nutrients are absorbed by tiny algae and giant kelp, and these plants are eaten by shellfish, which in turn are eaten by otters. Any contamination or damage to even the most distant links of the food web could have an impact on otters’ health, demonstrating problems in the ecosystem. 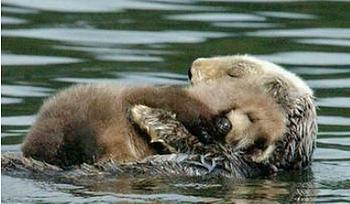 Sea otters in southwest Alaska are classed as threatened. In October 2009, the U.S. Fish and Wildlife Service designated 5,855 square miles of nearshore waters along the Aleutian Islands, Bering Sea, and Alaska Peninsula as critical habitat for the northern sea otter. The Alaska expedition is among the last of several sampling missions that began in 2008 at locations including Big Sur in California and the Katmai coast of Alaska. In the next two years, project researchers will utilize information from DNA analysis, disease and toxin studies, sea otter diets, fish growth rates, and satellite imagery to assess and compare the health of some of North America’s most iconic coastlines. Taking whiskers from wild otters could be tough, but the captured animals will be sedated during the biopsies. “We actually use the same anesthetics that doctors use for colonoscopy exams in humans,” says Dr. Mike Murray, chief veterinarian at the Monterey Bay Aquarium. Murray is the expedition’s veterinarian, operating a mobile otter examination clinic on the research vessel’s deck. The expedition will wrap during the week of June 6, and expedition photos will be made available throughout the summer. The project is led by the U.S. Geological Survey with research partners from the Monterey Bay Aquarium, Department of Fisheries and Oceans Canada, National Park Service, U.S. Fish and Wildlife Service, Seattle Aquarium, University of California, University of Idaho, University of Wyoming and California Department of Fish and Game.